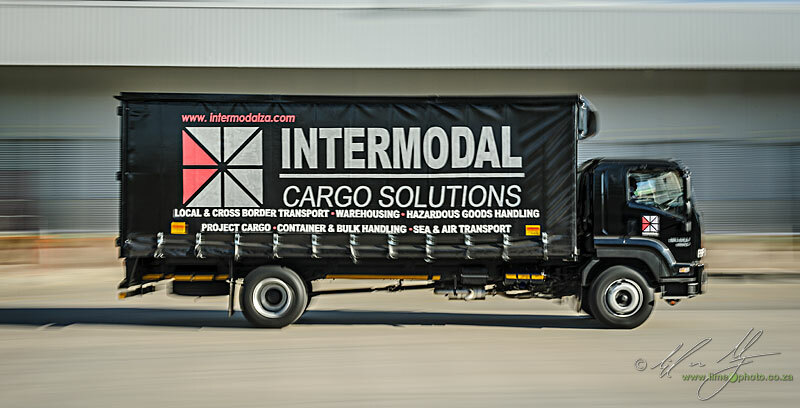 I have recently been involved in a project photographing a cargo company where a number of vehicles have had to be photographed. Part of the brief was to show activity and action, basically that the company is an active company, in contrast to one which appears as slow and stagnant. The whole point is to show that goods to be moved will be done with efficiency and speed. So movement became an important consideration in the images themselves. Videos show movement as another dimension basically. You can actually see the subject moving as the camera pans with it or follow focuses as it moves toward the camera. movement is therefore fairly obvious. For still images movement needs to be implied. Movement is seen either in the way that it is frozen, or the way that it is blurred during the exposure's duration. For these images I felt that blurred motion demonstrated the concept of movement and speed far more effectively than an image that has frozen motion (which quite frankly would look like the vehicle is parked rather than moving). A couple of problems need to be solved when you are trying to photograph moving subjects so that the subject stays sharp while the background blurs out. The first is obviously the simple act of panning, that is, moving the camera at the same speed as the moving subject. This is a lot more difficult than it sounds and does take some practice. The image below shows the 8 ton truck that was photographed in front of the warehouse facility. For this image we had the truck drive back and forth in front of the warehouse bays while I panned using an 80-200mm lens. The trick is to get the lens moving at exactly the same speed as the subject as it passes directly in front of the camera. Autofocus does make this easier, but you need to start tracking the vehicle from the very start. A rookie error is to try get the vehicle in motion by starting the pan at the beginning of the actual image capture. Rather, pan or track the vehicle from it's start and fire the shutter just before the moment that it is directly perpendicular to your position. Even then you might find that the edges of the vehicle will show some movement while the centre is pin sharp. This is in effect caused by the angle of view of the lens. Effectively it's as if the edges of the vehicle are moving at a different speed to the centre of the vehicle in relation to the swing of the lens (the last bit is the important bit). Sounds weird, but it's true. The next image was a little more complicated to capture than simply panning the camera with the moving vehicle. For the forklift I wanted to create an image that showed the forklift turning, but still sharp while the world around it literally spins. We did this indoors thankfully which gave me control over the lighting that we used. Lighting was therefore two strobes firing at 90 degrees to each other (each angled in at 45 degrees) through shoot-through umbrellas. A third strobe gelled with a 1/2 CTO was gaffer taped to a strut on the forklift to push some light into the driver's face and ensure some freezing of movement of him. We then gaffer taped and hung a heavy duty tripod from the palette that the forklift was carrying. The camera (D3x) with a wide angle lens was attached to the tripod so that it hung out over the concrete floor. The driver then slowly drove the forklift in a circular motion while I tripped the shutter via a cable release. 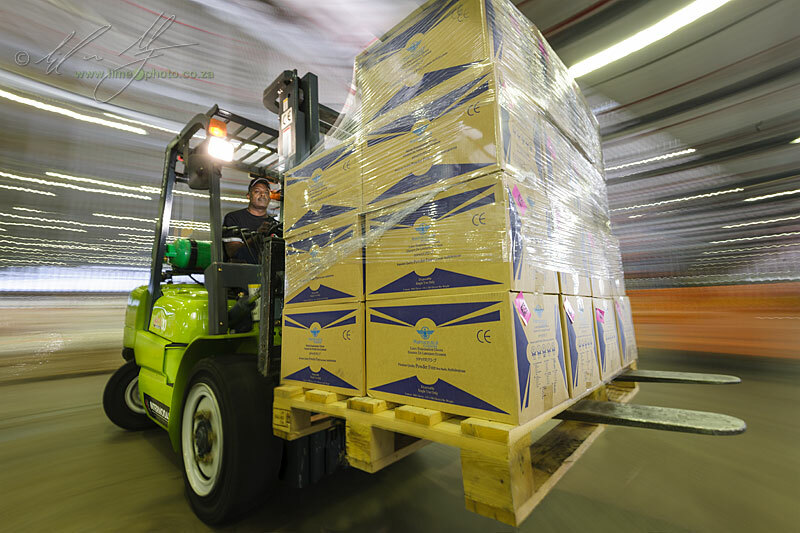 The forklift remains relatively sharp throughout because the camera and forklift stay fixed in relation to one another, unlike the image of the 8 ton truck where the ends of the vehicle seem less sharp than the centre. Still, things didn't work out entirely perfectly and I had to drop a portion of an image captured in perfect stillness over the moving image. The portion in question is the logo on the forklift. It was absolutely imperative that the logo be sharp enough to be read easily. The up and down bumpiness of the forklift moving meant that the logo was slightly shaken in the original image. It was a simple task of firing the shutter while the forklift wasn't moving and layering the logo in Photoshop. The cover image of this post was also the last image that we shot. 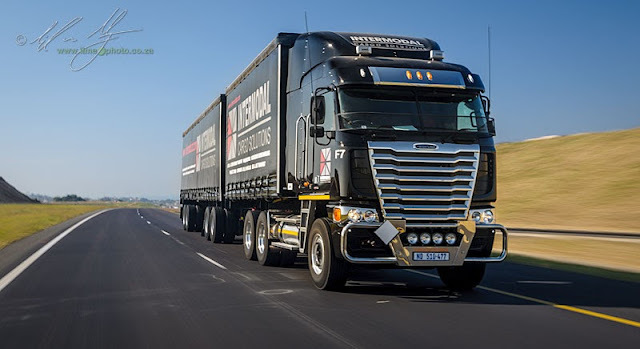 For this we drove the large truck onto a double lane highway south of Durban. When we had gotten away from the city, I jumped into the back of a bakkie (pick-up truck to non South Africans) and we orchestrated a little bit of synchronized driving. Whenever the road was relatively quite, we'd move the vehicles closer to each other and try to get them moving at the same speed. I would then shoot as much as possible during these brief moments of synchronization, dragging the shutter through the use of a polarizer and a 3 stop ND filter. Thankfully this worked out really nicely and there was very little I needed to do in post apart from add some local contrast and clean the image of dust bunnies. This has been an interesting project so far, and one which I have really enjoyed. Showing movement in imagery is a great way of creating more dynamic images that have the potential to be visually arresting. Most important for this particular assignment though, was the fact that the movement tells a story about the product that the client was wanting to sell. That is really the goal of commercial photography.